Prepare the white rice the way you like it. Slice the fennel thinly and put in a bowl. 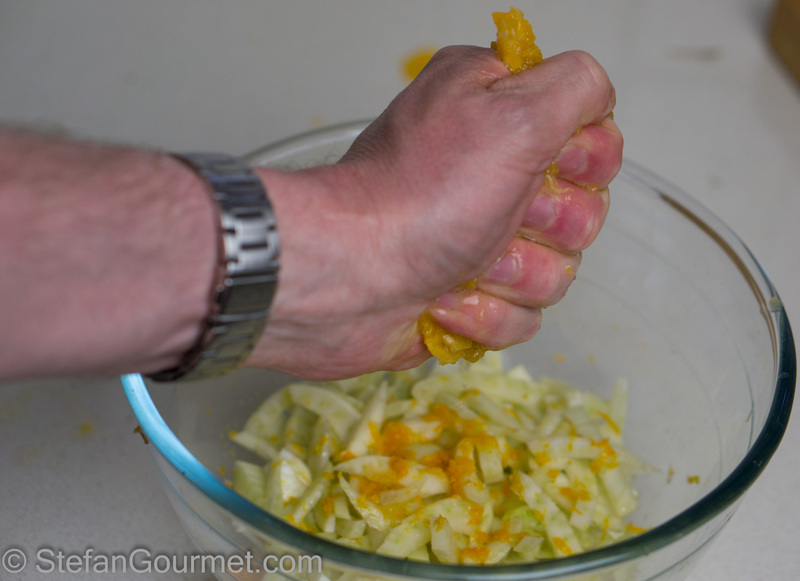 Add grated orange zest. 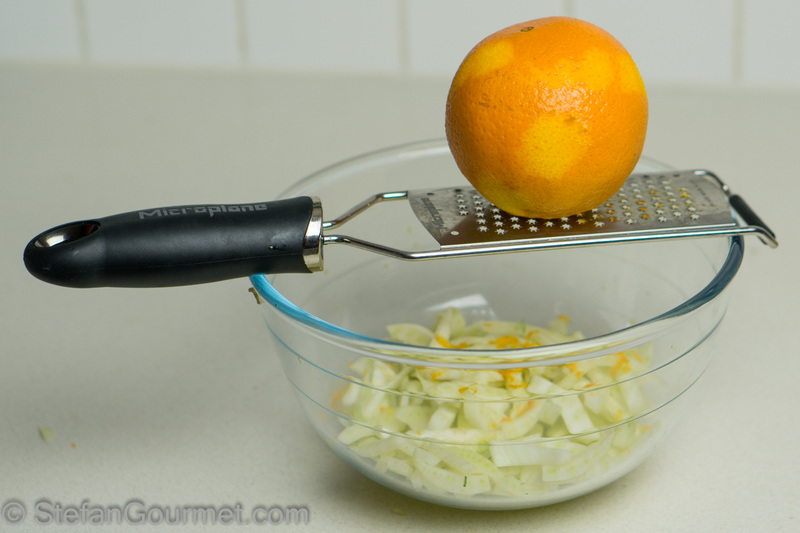 Peel the orange and cut the ‘supremes’ from between the membranes with a sharp paring knife. 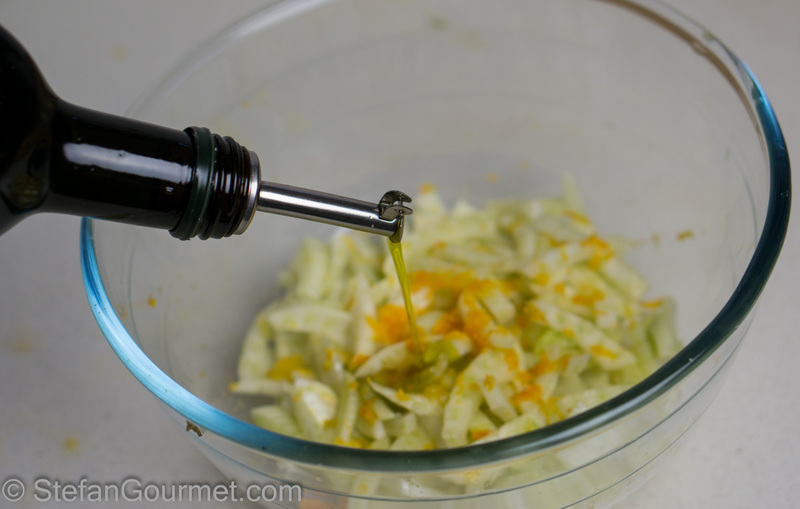 Do this above the bowl, so you will catch any dripping orange juice to dress the fennel. 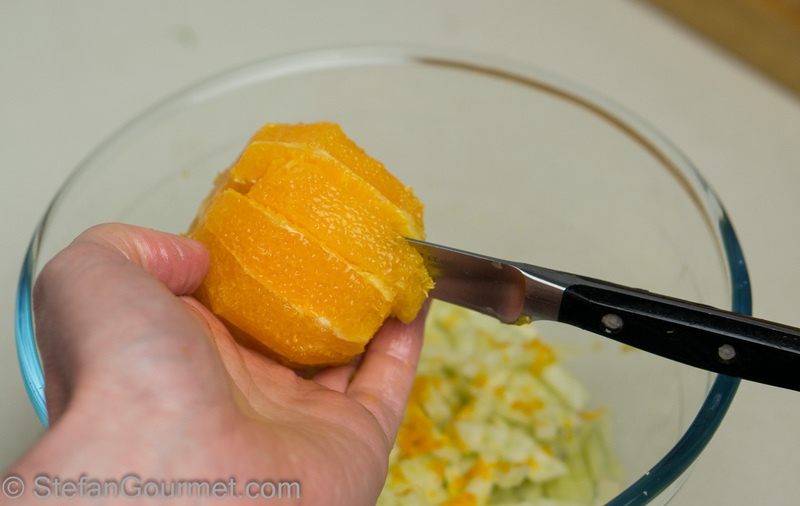 When you’ve finished cutting the supremes, squeeze the remainder of the orange to obtain the juice. Add the olive oil and salt to taste and toss to mix. 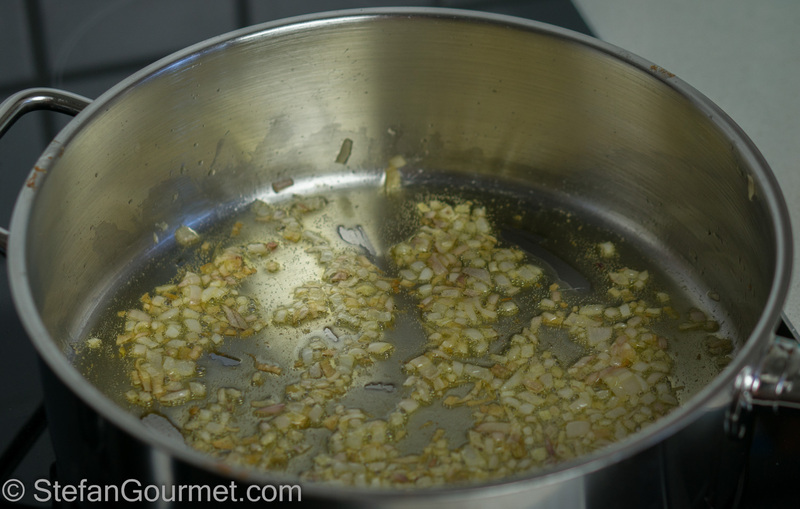 Sweat the shallots in the butter over low heat until soft and fragrant, about 5 minutes. 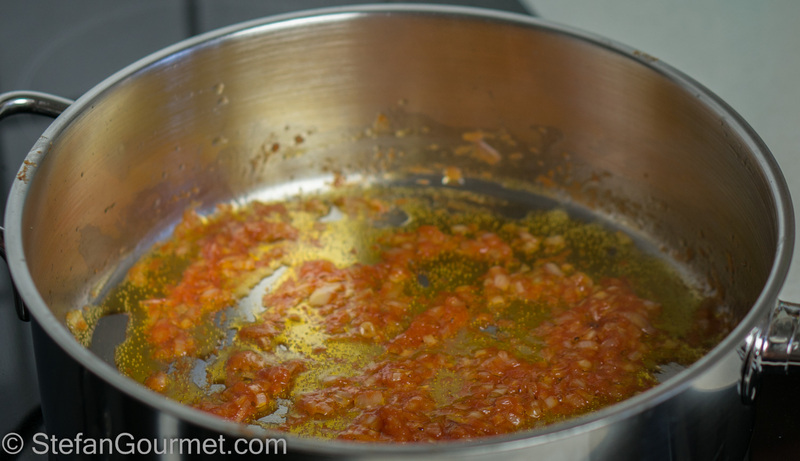 Add the tomato puree and stir to incorporate. 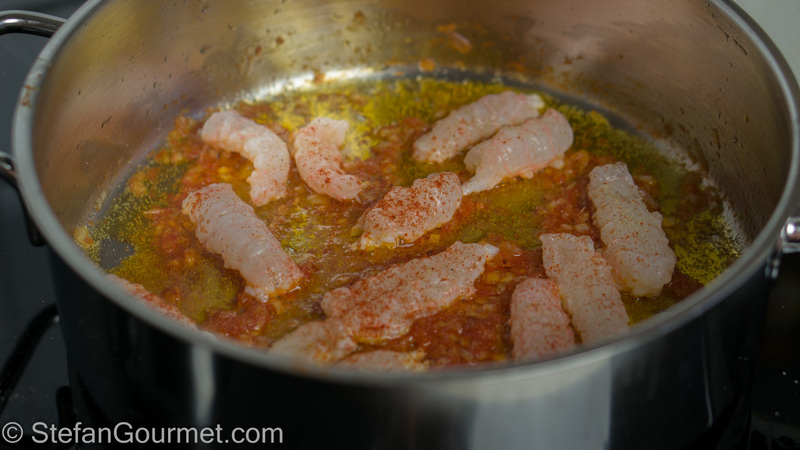 Add the scampi, and season with salt, freshly ground white pepper, and a dash of smoked paprika. Cook over medium heat for about a minute per side. 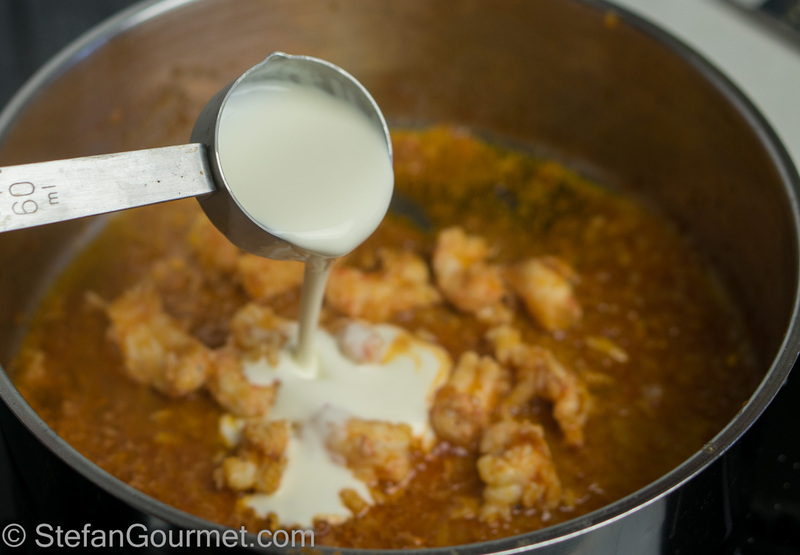 Add the Grand Marnier and cook for a minute, stirring. 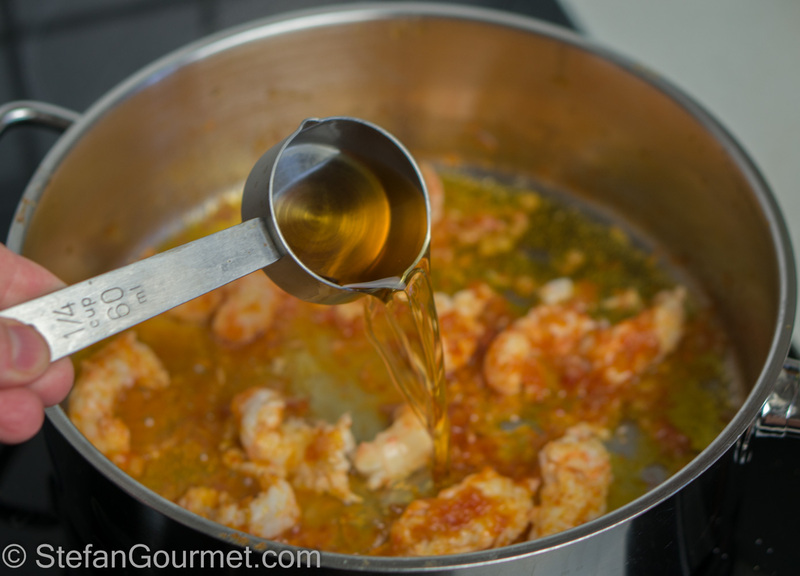 Stir and cook over low heat until the sauce has a nice consistency. Taste and adjust the seasoning. 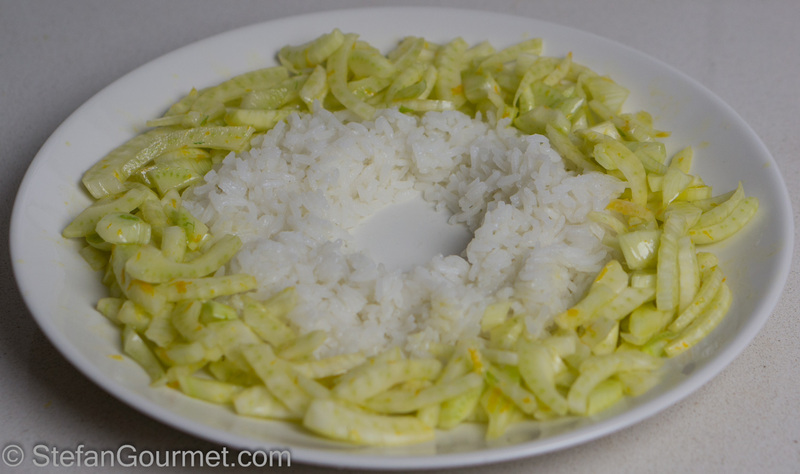 Arrange a ring of rice on each plate, and surround it with a ring of fennel salad. 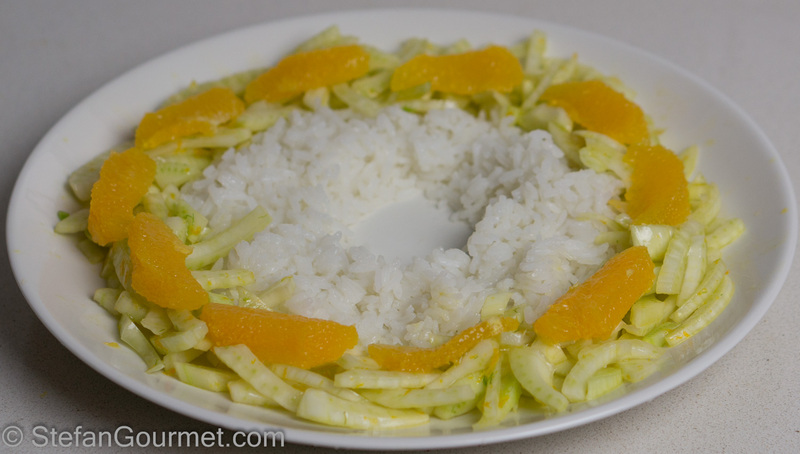 Arrange the orange supremes on top of the fennel salad. 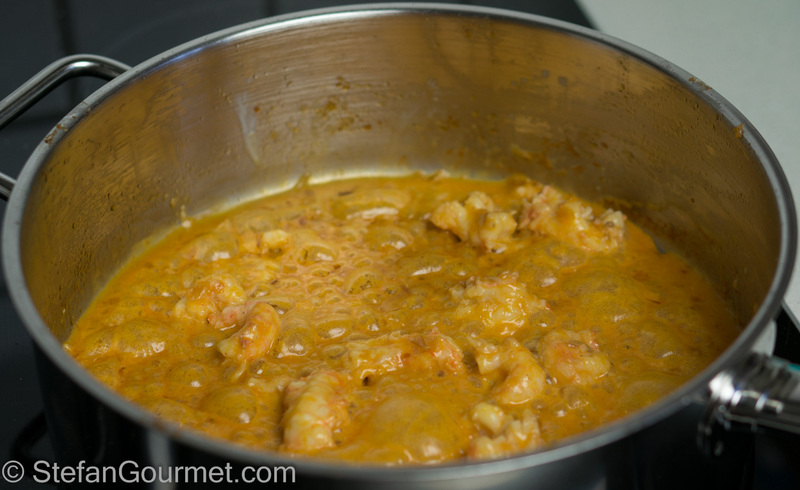 Finish with the scampi and sauce in the center, and serve at once. 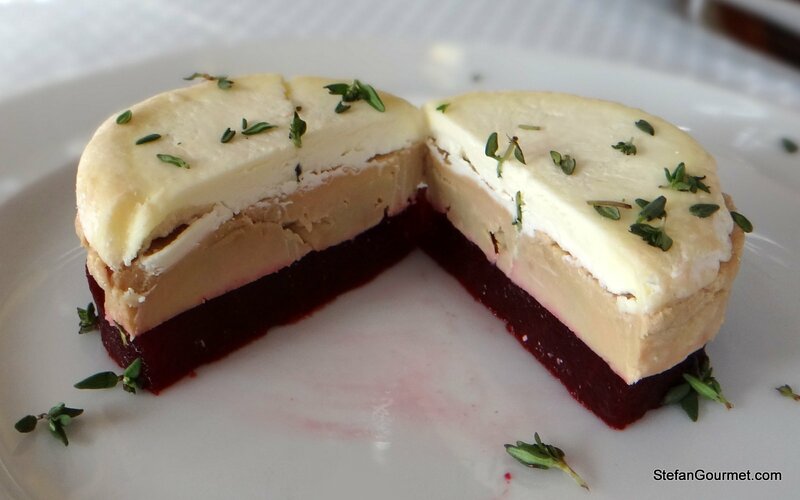 Foie gras with beetroot and goat cheese sounds like an unlikely flavor combination, but it works really well. When eaten together, it has the great effect that you first taste the beetroot, then the foie gras and finally the goat cheese. The colors of purple, pink, and white look pretty as well. Grazie a te Stefan per la citazione, ma i complimenti vanno a te che con un semplice suggerimento hai creato una grande ricetta: bravo! Wow Stephan! What a fantastic combination. 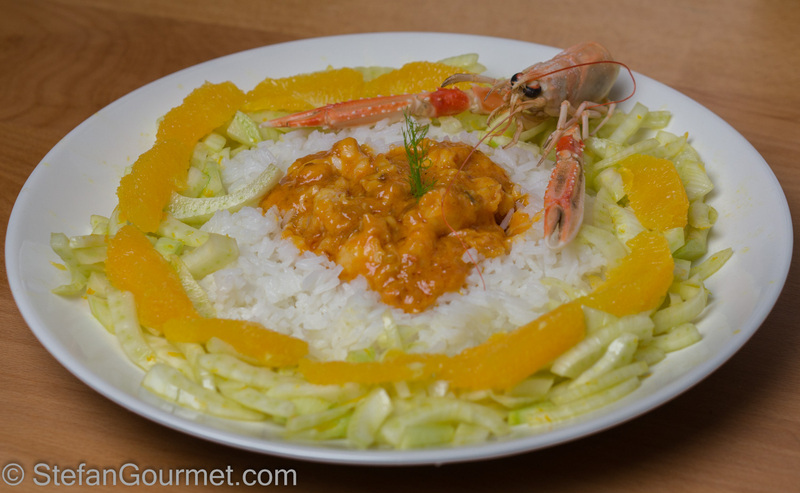 I love anything with fennel and orange but adding cream and shrimp to the dish makes my mouth water. Great recipe and wonderful post as usual. 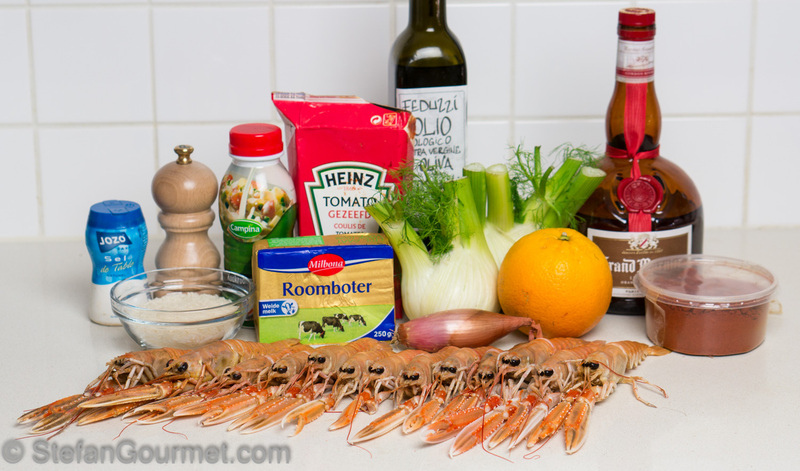 A lovely fresh flavour and textural combination I must try tho’ with big prawns: do not have access to scampi: methinks I shall use Cointreau . . . if you were onesome in the kitchen – some clever one-hand photography also . . . . I really enjoy a fennel salad – and this looks great. Thanks and well spotted. I prepared only half of the recipe because I was by myself, but listed the ingredients for 2. Oh ma sti finocchi! Ormai non sono più di stagione, ma il piatto è veramete da provare. D’altro canto, certi cucinieri sono una garanzia!